In this short guide you will learn how to correctly upload your very own mod to that page, and the things you should know about it. What is the 'MODS' page? The 'MODS' page works like a repository. You can upload your very own mod in there, and the users will be able to find new mods easier. 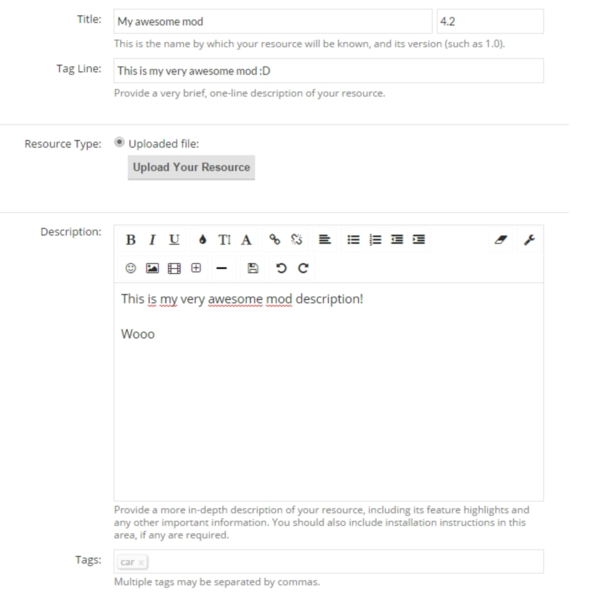 Mods make use of TAGS, which helps to categorize them correctly. Mods are approved from our staff before going public there, that to ensure quality and avoid broken stuff. Mod's author can easily update their mods. Users can easily review (those are also moderated from us) and ask help on mods. Users can 'follow' a mod and get notified when it gets updated. While being logged on, simply head to the 'MODS' page and click the 'Add Resource' button. Next you will see the page where you can setup the Mod Title, Description, Version, Tagline and upload your mod. To upload your mod simply click this button and choose the ZIP. Make sure your mod works by simply placing the ZIP in the 'mods' folder without requiring any extra steps. The second half of that page will let you setup the Tags, Link to Support Thread, etc. Keep the URL boxes empty for now. When done, simply press 'SAVE'. The thumbnail must be sized 96x96. Please upload one, it will make it easier for user browsing for mods to get a clearer idea of your mod. If you already have an existing thread for your mod, simply add the link in your mod description, and when we will review your mod, we will take care of assigning your mod to the thread specified.